SLIDES - We sell both 4ft. and 6ft. slides in blue and white. Custom colors (such as gray or tan) and other sizes are also available! 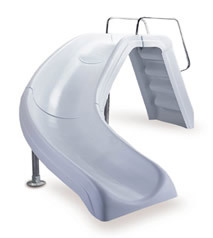 These slides come with closed fiberglass steps. 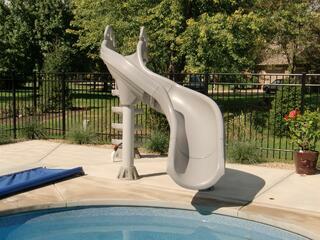 Other specialty slides are also available such as The Extreme Slide (picture to the left below). For more information, go to SR Smith's website and take a look at their slides! BASKETBALL AND VOLLEYBALL. Basketball and volleyball sets come in all qualities and prices. Note that a volleyball set does not make much sense in a deep pool. To the right is a standard volleyball and basketball set that sells for about $600. It comes with 3 anchors with a hole 2 1/2" wide to accommodate the extra wide poles that support these games. This is a fairly standard set that we sell all the time but there are upgrade sets that are even more heavy duty. We would not recommend any of the "light duty" sets that are also available.